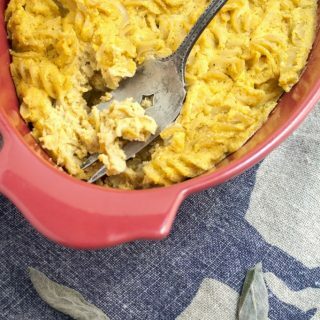 Baked Pumpkin Sage Macaroni and "Cheese"
In the interest of not exhausting the pumpkin thing long before even Halloween gets here, let alone Thanksgiving, I am trying to restrain myself. But it’s hard. Maybe there is something to this whole mantra about eating seasonally because that’s what your body craves or whatever. At least that is my story and I’m sticking to it, because I really want to eat all of the pumpkin I can get my hands on. But it’s fall and that means football and tailgating, and, though I have only tailgated once or twice (Go Blue!) and I think the only food that was served went disturbingly quickly from freezer to microwave to soaking up the watery beer in my stomach, I hear that more adept tailgaters than I seem to take this very seriously. 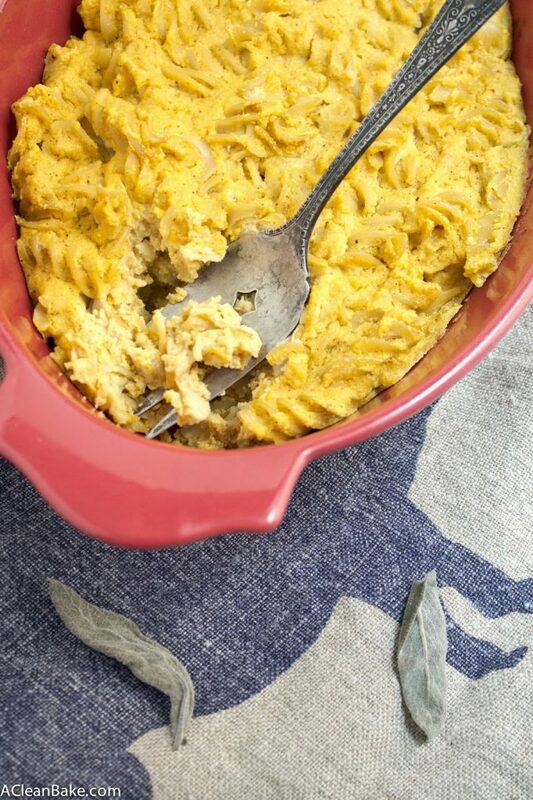 To those who love football (or at least tailgating) and love food, and may not be able to eat all of it indiscriminately, this one is for you: gluten-free, dairy-free mac and cheese. Er, “cheese”. Though it is still creamy and comforting, as any good mac and cheese should be, the baking process shores it up a bit so as to be more capable of being transported to a stadium parking lot and eaten in between keg stands. Or whatever you crazy kids do. But, if you want a more traditional mac & cheese dish, eliminate the eggs from the sauce and skip the baking process. Just fold the pasta into the (eggless) “cheese” and serve. You can use any pasta you want, but I tried it with both gluten-free brown rice pasta from Trader Joe’s and regular whole wheat, and I found the whole wheat seems to soak up a ton more moisture than the gluten free version, so it didn’t end up with my preferred sauce-to-pasta ratio. Just fair warning. It works great with the gluten-free pasta (at least the variety I used). The “cheese” is a combination of cashew cheese (which stood in for cream cheese here), nutritional yeast, which is a vegan powerhouse food that has a decidedly cheesy flavor, and of course, pumpkin, which lends moisture and texture and, of course, well, it’s pumpkin. Whether you’re heading to a tailgate or just looking to spice up your bagged lunch routine, this comforting dish is just the ticket. Cook the pasta according to the directions on the box. Drain and set aside. Preheat the oven to 350F. Grease an 8"x8" (or equivalent) baking dish and set aside. In a small bowl, cover the cashews with boiling water to about 1" above the cashews. Set aside to soak for a minimum of 30 minutes. Once they are softened and have absorbed some of the water, drain them, reserving the soaking liquid and puree them in a food processor with 2-3 T of the soaking liquid, or as much as it takes to create a smooth and creamy consistency, like hummus. Discard the unused soaking liquid. In a large mixing bowl, combine the cashew puree with the rest of the ingredients except the pasta and stir to thoroughly combine. Gently fold in the cooked pasta and mix until it is thoroughly coated and incorporated with the sauce. Pour the whole mixture into the prepared baking dish, smooth into an even layer, and bake for 30-35 minutes until the top is crisp. Serve immediately, or store in an airtight container in the fridge for up to a week and reheat before serving. I used Trader Joe's gluten-free brown rice fusilli. You can use any brand, grain or shape you want, but it might slightly change the texture of the final product. You can substitute any other squash puree, such as butternut or acorn, if you prefer. If you want a more traditional mac & cheese dish, eliminate the eggs from the sauce and skip the baking process. Just fold the pasta into the (eggless) "cheese" and serve. Nora, this mac and cheese sounds so perfect for fall! I can’t resist putting pumpkin in pretty much anything (but I eat pumpkin year round so I never get sick of seeing it–aka, post more pumpkin recipes)!